A huge benefit of passive solar design is that it saves money that would otherwise be spent on utilities toward and heating and cooling bills. It is a clean and efficient use of energy because it is based off of a type of energy that is readily available and occurs naturally. As long as the sun continues to rise and fall, its energy can be harnessed. Because of this constant, the sun’s energy can be harnessed simply by designing your home orientated to the predicable movements of the sun. Instead of spending money on high energy bills for natural gas or electricity, you can instead focus on getting that perfect bookcase or garden, or take a vacation! With a little planning and small modifications in the building’s design, solar energy can be harvested and used, simply by the building as it passively sits there. Another benefit is the positive impact on the air quality in the winter. 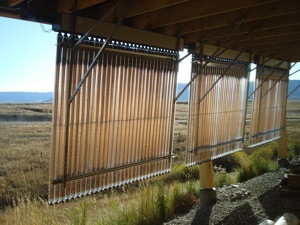 A well designed passive solar building will use less energy resources for heating and cooling. I took this picture on a hike in the middle winter. As I hiked up out of the valley to look at the view toward the mountains, I also saw a big cloud of smokey haze. Wood and other fuels burned in the winter causes a haze almost obliterating the view of Mt. Sneffels. Here’s a philosophical analogy: passive solar design is to building – is as aikido is to martial arts. Aikido uses focused, yet minimal movements and energy to dispel large amounts of incoming (sometimes unfocused) energy. Passive solar design is like the aikido of architecture. Passive solar design is focused to utilize already existing energy. It is the ultimate in smart green design because instead of simply and constantly trying to keep the elements out of the living area, it instead works with them. There is immense beauty in the potential and possibilities of this type of design. 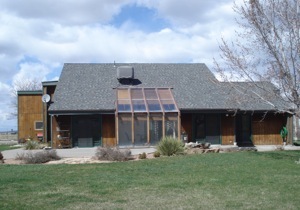 A sunny place like Colorado that has 300+ sunny days can be an ideal place for passive solar design, yet that still means that there are about 65 cloudy days when the sun may not be able to provide adequate energy and heat. Passive solar design can greatly offset supplementary energy costs, but it alone may not provide all the heat or energy that is needed by a household or building. If a home is designed and built well, it will greatly offset reliance upon other forms of heating and cooling energy costs. While it also cuts down on pollution associated with electricity, natural gas or coal. 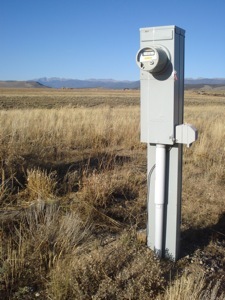 In order to be comfortable in a passive solar home in a wintry cold climate, other supplementary means of heating the building is typically needed. A passive solar home can be supplemented with active solar, an electric grid tie in, natural gas, coal or diesel generators, or geothermal heating and cooling. There are many different possibilities and configurations. This is the challenge within the design of passive solar dwellings, to be beautiful in form, enjoyable and highly practical. It is this challenge that we embrace and find fascination in. This website highlights all forms of passive solar design, looking at all the different materials, designs and different sources of electricity that makes up the beauty in passive solar design. Well said, but everyone needs to understand that adding Solar on their house is an asset which could improve the long term valuation of their building if / when they choose to sell. With the environment the way it is going we simply cannot overlook any system that offers totally free electricity at no cost to both the client and more significantly the earth! I totally agree with you Tad! Such a great post! It says everything. The benefits and challenges were laid very clearly. A blog post that is worth to be shared.